How do I set a custom date range? Most reports and screens in Rival IQ use a date range visible in the upper right hand corner of the screen to filter the available information by that date range. To change the date range for your data, select a different value from the drop list or specify a Custom Range to filter the information in your landscape. 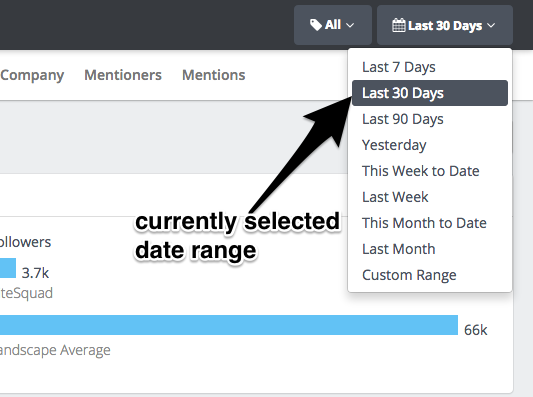 Custom Ranges can be as little as a single day or as large as the amount of data in the system. 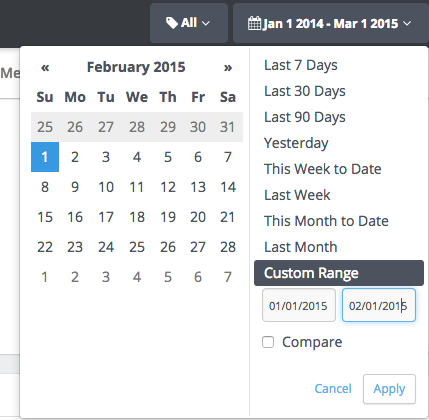 For example, this custom date range sets the filter to show information between January 1 and February 1 of 2015. If you need to compare your custom range with a different prior date range, check Compare and specify the Custom Comparison Range. Rival IQ has a shared company model where companies are added as unique URLs (web pages) by customers as those customers add the companies to Landscapes. This means Rival IQ may have different numbers of days of history for the companies in your landscape. 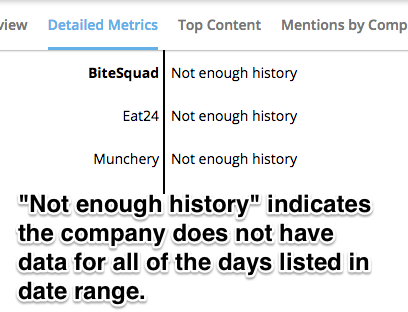 If you encounter the message “Not enough history” (shown below) you may be on a limited data set during your trial or there may not be available history for that metric for that Company in the Rival IQ system. Rival IQ tracks “observed metrics” like Followers and Following from the day a company is added to the Rival IQ database. For other metrics like the number of posts or the engagement totals achieved on each post, the information is retrieved regardless of the day the company was added to the Rival IQ database and is limited to the individual channels and the available data history that can be returned. 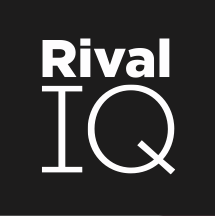 Rival IQ trials are limited to 30 days of history for all companies. Rival IQ subscribers see the entire data history Rival IQ maintains for a company. If you need additional data history in your Rival IQ account, please contact us.